After a year working for her family's 60 year old glass business, Barbara Mulqueen saw a need in the Denver area for a local supplier for tool, equipment and shop supplies. Two years later in 1987 she opened Western Glass Supply with goals of servicing shops with the latest information, tools, and customer service. Today, still owner and operator, Barb, with the help of a staff dedicated to customer service and glass experiance, has grown Western Glass Supply to service accounts nationwide, some international. We are friendly, answer our own phones, and try very hard to get you taken care of. 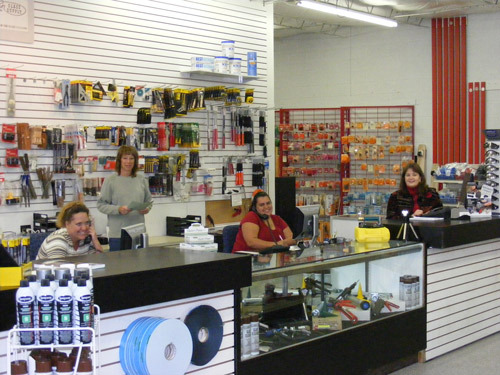 At the 355 Yuma, Denver location, a new 3500 square foot store was added in addition to office and warehouse so installers, glazers, estimators and owners can come in and evaluate products and see options for meeting their project or shop needs. This online store has been updated with better pictures and offers with easy ordering and volume discounts. We enjoy seeing people in our store, but invite anyone to order by phone, fax, or website.